The present study is situated in the context of cognitive aspects of language processing as it focuses on the learning and teaching of grammar in various modes of presentation. The success of the programs developed for, and used in, the study is measured in terms of short- and long-term learner performances in the application of grammatical rules. Four groups of informants were formed to test four different combinations of the presented materials. The groups used either a cognitive/functional or traditional rule-governed approach to grammar explanation in either an animation or static presentation mode. The results document the overall superiority of the cognitive/functional approach to grammar when presented in the animation mode. The design of the study and its results could serve as a reference point for further research and could help refine parameters for the evaluation of effective language learning software. Software Evaluation: The evaluation of software usually is done by applying non-systematic checklists to a particular program. 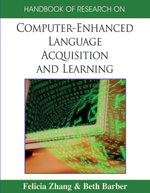 More recently, theory-based approaches to software assessment have been proposed which incorporate relevant criteria derived from linguistic, pedagogical and psychological models of language learning and teaching. Prepositions: Prepositions are used in many languages to connect content words such as verbs, adjectives, names, nouns and pronouns to other content words. In languages such as English, French and German they often require an article (the, a, an in English) to connect to a noun. In German, that article generally marks the semantic function of the connected noun or a purely grammatical link using a particular case marking. The markings are frequent and often carry meaning. Two-way prepositions require a certain case marking based on whether or not they mark a change of location or a crossing of a boundary. Because prepositions are plentiful and require grammatical markings, they pose a particular problem to learners. Grammar Animation: Grammar animations are used to visualize grammatical rules which are otherwise difficult to explain. Grammatical rules which express a movement or process are best suited for animations. Abstract verbal descriptions or static visual information often do not capture the essence of such rules. Cognitive Theory of Multimedia Learning: The central element of the cognitive theory of multimedia learning is the dual coding theory which claims that the processing of verbal and visual information occurs in two functionally separate representational subsystems in the semantic memory. As a result, two separate mental projections are produced during the simultaneous processing of verbal and visual information modes. Processing information in different modes and coordinating the processes relies on the availability of sufficient cognitive capacity as processing resources are not unlimited at any given time. An exceeding demand on available capacity can produce an overload effect making it more difficult or impossible for a learner to process the information or reintegrate it into a coordinated entity. The success of the learner not only relies on the availability of sufficient resources but also on the manageability of the resources. Cognitive overload can be caused by processing tasks which are irrelevant for learning. In these cases, the manageability of processing can be secured or restored by reducing the extraneous load. This component of the cognitive theory of multimedia learning is known as the “cognitive load theory”. Conceptual and Functional Presentation of Grammar: Other than formal and rule-governed explanations of grammar, conceptual and functional approaches focus on understanding and explaining the underlying concepts as well as the semantic and pragmatic functions of grammatical structures. They are often process-oriented approaches to language rather than merely structural ones. Contiguity Effect: In language learning a contiguity effect can occur when verbal information is accompanied by related and well coordinated visual information. In such instances it can provide support for the learner’s mental processing of the content. If the processing is not coordinated interferences are likely to occur making it more difficult for learners to process and retain the information. Case Markings: Languages such as Russian, French or German use an inventory of grammatical cases to mark certain grammatical functions in a sentence, such as the subject (“doer of an action”/nominative, object/accusative or “receiver of an action”/dative). In English, only the genitive case (Mary’s friend) explicitly is marked. The markings are generally expressed by endings of the nouns and/or, as in German, by particular forms of the articles.